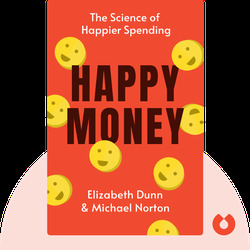 Happy Money (2013) explains how you can and should spend your money to maximize your happiness, through five simple principles that can be applied to your everyday life. Elizabeth Dunn is an associate professor of psychology at the University of British Columbia in Vancouver. Her work has been featured in top academic journals and hundreds of media outlets worldwide. Michael Norton is an associate professor of marketing at Harvard Business School, who in 2012 was selected as one of the “50 People Who Will Change the World” by Wired magazine.